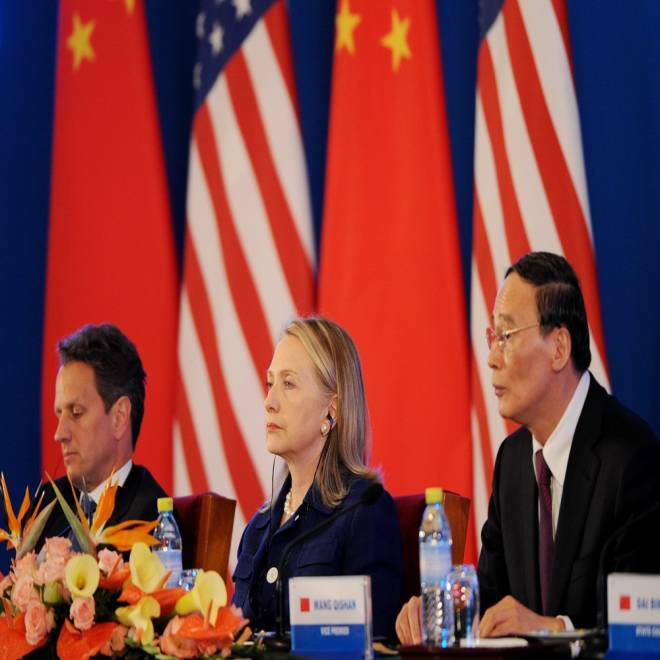 Treasury Secretary Timothy Geithner, U.S. Secretary of State Hillary Clinton and Chinese Vice-Premier Wang Qishan attend the joint statment reading for the closing of the U.S.-China Strategic and Economic Dialogue in Beijing on May 4. BEIJING – It may be Hillary Clinton’s final trip to China in her current role as Secretary of State, but China’s state media has not held back in saying what they really feel about the former first lady and, by extension, the United States. In an editorial entitled, “Secretary Clinton: the person who deeply reinforces US-China mutual suspicion,” in Tuesday's edition of noted nationalist newspaper, Global Times, the paper took Clinton to task for her “meddling” in the South China Seas and Diaoyu/Senakku disputes. Other Chinese state media avoided blaming Clinton for the current heightened tensions in the Asia-Pacific region, but nevertheless took issue with America’s recent “pivot” in the region. Nearly two weeks after fleeing his country, Chinese dissident Chen Guangcheng on Thursday spoke out saying his family has been the target of retaliation from Chinese officials. The NOW w/ Alex Wagner discuss what's next for Guangcheng and his family. Clinton has pledged to take a strong message to Beijing on the need to calm regional tensions over maritime disputes that have raised broader fears of military friction between the two major Pacific powers. The last time Clinton visited Beijing, plans to highlight improving U.S.-China ties were derailed by a blind Chinese dissident whose dramatic flight to the U.S. embassy exposed the deeply uneasy relationship between Beijing and Washington. This time, the irritants are disputes over tiny islets and craggy outcrops in oil- and gas-rich areas of the South and East China Seas that have set China against U.S. regional allies. As Clinton preps for Asia-Pacific tour, is North Korea capable of reform? As Clinton prepares to travel back to Beijing on Tuesday, U.S. officials say the message is once again one of cooperation and partnership -- and an important chance to compare notes during a tricky year of political transition. But the unease remains, sharpened by disputes in the South and East China Seas that have rattled nerves across the region and led to testy exchanges with Washington just as the Obama administration "pivots" to the Asia-Pacific region following years of military engagement in Iraq and Afghanistan. Both governments, too, are preoccupied with politics at home, with the Obama administration fighting for re-election in November and China's ruling Communist Party preparing for a once-in-a-decade leadership change. That position has dominated state media coverage of Clinton's visit to the region this week, manifesting itself in a consensus that the United States was behind much of the recent emboldened confrontations between other Asian powers – most notably the Philippines and Japan -- and China. Whether state media's depiction of the U.S. Secretary of State accurately reflected the opinions of China's population was unclear, however. On China’s popular twitter-like service, Weibo, reaction to the editorial was mixed. “History will prove that she [Clinton] is the real peacemaker," another user wrote.